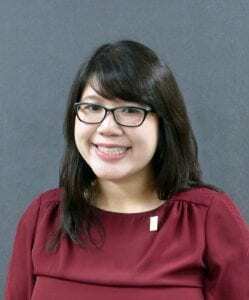 Aurora Le, an academic specialist and graduate student at the IU School of Public Health-Bloomington, has been awarded the prestigious K. Patricia Cross Future Leaders Award. This award recognizes graduate students who show exemplary promise as future leaders of higher education; who demonstrate a commitment to developing academic and civic responsibility in themselves and in others; and whose work reflects a strong emphasis on teaching and learning. Le is among seven recipients chosen in a rigorous process from a pool of 200 nominations from 120 institutions, noting the recipients’ demonstrated or potential leadership abilities in teaching and learning and their strong commitment to academic and civic responsibility. The Cross Award is open to all doctoral-level graduate students who are planning a career in higher education, regardless of academic department, nominated by a faculty member or administrator. The awards honor the work of K. Patricia Cross, professor of higher education, emerita, at the University of California–Berkeley. “This year’s scholars are serious and published researchers, award-winning teachers, campus leaders, and catalysts for campus/community involvement. Their stories are amazingly diverse — and, taken together— give us a vision of an American higher education that will serve our increasingly complex society,” said K. Patricia Cross. Le and the other six Cross Scholars will be recognized at AAC&U’s 2019 Annual Meeting, “Raising Our Voices: Reclaiming the Narrative on the Value of Higher Education” in Atlanta, Georgia, on January 23–26. They will be honored and introduced to the AAC&U community during the Opening Plenary and will speak in the session, “Faculty of the Future: Voices from the Next Generation.” The Cross Award recipients will also participate in other sessions and meetings throughout the conference. Le’s areas of research include highly infectious diseases and occupational safety & health, with a focus on training and education. Le is the Project Coordinator and Educational Specialist of the Biosafety and Infectious Disease Training Initiative (BIDTI), a National Institute of Environmental Health Sciences (NIEHS) Worker Training Program. She is also an Adjunct Instructor for the Department of Applied Health Science at the School of Public Health-Bloomington. Previously, she supported the research activities of the Nebraska Biocontainment Unit after the treatment of three Ebola-confirmed patients at the unit in 2014-2015, and was part of the exercise design team for the National Ebola Training and Education Center (NETEC). Her current research includes infectious disease mitigation and management in non-healthcare worker populations, and the intersection between health behavior and occupational safety & health.